A ramblers group is calling on walkers to raise their objections over military training on Dartmoor amid a crucial consultation on the issue. 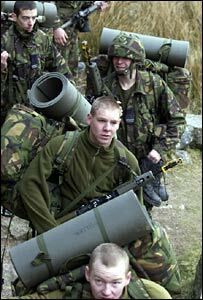 The Ministry of Defence's (MoD) licence to use Dartmoor runs out in 2012. The military has licences for firing on 13,000 hectares of National Park land, and five infantry units are based within an 80-mile radius of the moor. It says there is increasing demand for training on Dartmoor but the Ramblers Association wants the military out. The current licence - issued by the Duchy of Cornwall, which owns most of the land - is due for renewal in 2012. Commandant of Dartmoor Training Camp, Lt Col Tony Clark, says the process could help adapt how the military uses the moor in the future. He said: "We want a good, open and sensible discussion about military operational effectiveness on Dartmoor, but equally having due regard for the national park purposes of conservation and public access." But John Skinner, access officer for the Devon Ramblers Association, says military training limits public access and should not be allowed in a national park. He said: "The highest points in southern England are on the Okehampton firing range. "It's a splendid area. There are superb views across to Exmoor, but if the army is firing across the range you cannot go there." The MoD is holding exhibitions on Monday at Tavistock town hall and on Tuesday at Okehampton, at the Museum of Dartmoor Life from midday until 2000 GMT. MoD staff will be answering the questions from people who can also register concerns at the website www.dartmoor-ranges.co.uk. There will be more consultation next year and the MoD will also be carrying an environmental impact assessment before handing in the application to the government in 2008. The military has had a presence on Dartmoor for more than 200 years, long before it became a National Park.